The Hydrovane HV (ACE) series of vertical enclosed fixed speed rotary vane compressors offer world class flexibility and reliability, and the smallest footprint of any rotary compressor in the industry. Slow speed direct drive operation coupled with few moving parts means less components to fail and no power loss through belts or gears. Maintenance costs are reduced by the simple construction and grouped service components; spin-off / spin-on separator and filter elements further simplify maintenance and decrease the time required for routine service. The 1.1 and 2.2 kW models won the Design Council award linking simplicity of operation with proven reliability. 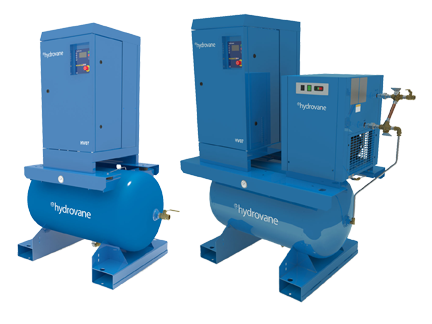 Nuvair is a distributor for the Hydrovane line. Visit the Hydrovane website compressor page here Hydrovane and find a model that matches your requirements. Once you have the model or models your interested in shoot us an email and we will quote you delivery time and pricing.